On occasion of International Day of Persons with Disabilities, Aster DM Healthcare announced fulfillment of commitment to employ 100 differently abled people across the Company’s operations in 9 countries. Currently, 108 differently abled are employed with Aster. To commemorate International Day of Persons with Disabilities, Aster DM Healthcare organized an event called “Common Ground” for the differently abled employed with the Company across India and GCC. Hosted at Aster Medcity Hospital in Kochi, the event was held to recognize the efforts of differently abled individuals and highlight their contributions across the company. Broadcasted live across all Aster units globally, the event brought together the Company’s 17,700 employees on one platform to celebrate an inclusive culture. The event saw the presence of an inspirational speaker Ms. Preeti Monga, the Founder and CEO of the Silver Linings Trust & Silver Linings Services. Speaking on the occasion, Preeti Monga said, “Being differently abled should not be a hindrance in the path of your success. With the advent of technology and change in the corporate structure of organizations, inclusion is the new pillar of building a successful eco-system. Inclusion empowers us to be self-dependent and adds value to the organization. I am delighted to be a part of this great event and would want to wish all the best to the Asterians.” She has been visually impaired since age six. Through her various portfolios, she works for differently abled people, promotion of eye donation and empowerment of women. 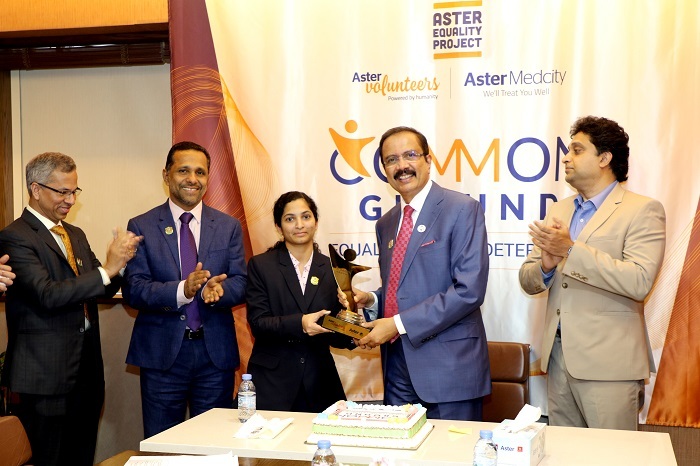 To commemorate International Day of Persons with Disabilities, Aster DM Healthcare organized an event called “Common Ground” for the differently abled employed with the Company across India and GCC.